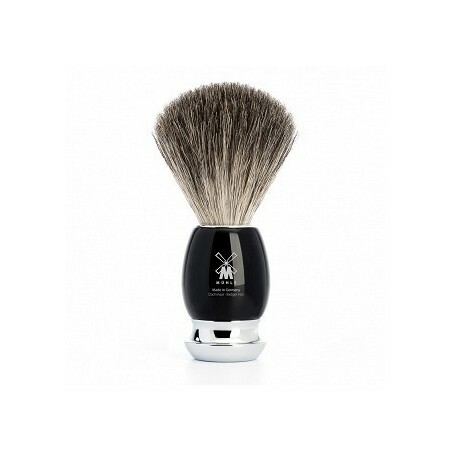 Mühle Shaving Brush Pure Badger Vivo Series with high grade resin black handle. The VIVO series from MÜHLE further develops and reinterprets the classic design vocabulary of its predecessors. The slightly bulbous shape of the handle tapers down to the chrome-plated base. The opposite curve of the brush and razor base is a typical stylistic feature of classic design which at the same time guarantees a secure fit in a specially developed holder. The handle is made of high-grade resin in black. The exclusive high-grade resin polished to a glossy finish and the natural surface of the wood are pleasant to the touch. In the combination of form, weight and surface quality the brushes and razors satisfy not only aesthetic, but also ergonomic requirements. 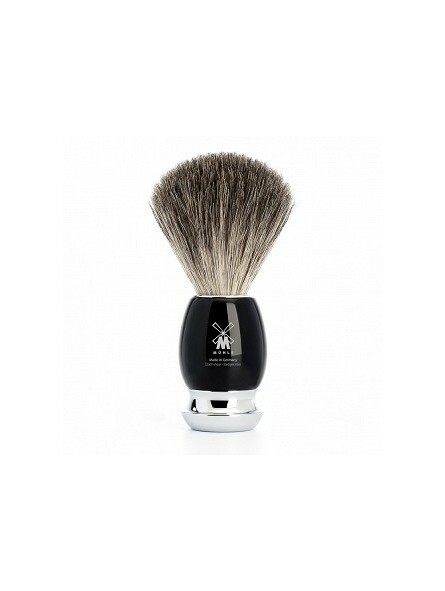 Pure badger - Solid quality for wet shavers who like a massaging effect while preparing to shave. The band of natural hair is machine-made, and the hairs are more flexible than bristles. The colour spectrum ranges from brownish-grey to black. High-grade resin requires expert craftsmanship. The material is turned from round rods and polished. Handles in this design are highly durable and possess excellent haptic properties.